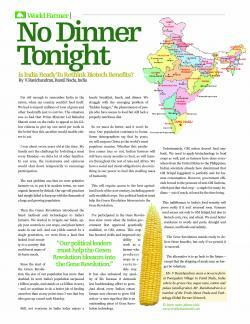 No Dinner Tonight - Is India Ready To Rethink Biotech Benefits? I’m old enough to remember India in the 1960s, when my country couldn’t feed itself. We had to import millions of tons of grain and other foodstuffs just to survive. The situation was so bad that Prime Minister Lal Bahadur Shastri went on the radio to appeal to his fellow citizens to give up one meal per week in the belief that this sacrifice would enable others to eat. Three Billion Acres and Growing! We don’t know exactly where it happened, so there weren’t any fireworks or parades. It could have been in my country of Brazil. It almost certainly was in South America where an early planting season offered the correct timing. But sometime in the recent past, the acres planted to biotech crops passed three billion acres, according to Truth about Trade & Technology, an American non-profit group keeping track of planting reports from world governments. Agronomic solutions and advanced irrigation management from T-L Irrigation and CropMetrics. T-L Irrigation Co., manufacturer of hydrostatically powered pivot and linear irrigation systems, announces VRI application, the latest advancement in web-based irrigation management and services combined with T-L’s family of pivot management control systems. Developed by CropMetrics, the Precision Irrigation Management services provided, when coupled with the Precision Link and the Precision Point III (PPC III) Control Panel from T-L, allows irrigation management with data- driven VRI prescription. · Agronomic VRI control is facilitated with CropMetrics Precision Irrigation Management Services. INDIANAPOLIS (Wednesday, Oct. 24, 2012) – Hundreds of FFA members will volunteer their time and skills Thursday and Friday to help a host of Indianapolis-area organizations. Each year during its annual National FFA Convention & Expo, the National FFA Organization stages itsNational Days of Service and encourages students to volunteer. The program is designed to educate FFA members about the importance of community service to both local communities and their own personal development. This week, the American Enterprise Institute (AEI), a conservative think tank, took a few more swipes at the policies on which America's farmers depend. That includes the very crop insurance system helping the men and women who grow our food get back on their feet after an historic drought. Sept. 13, 2012… St. Louis, Mo… In response to Thursday’s introduction of a discharge petition by Rep.
On land where wheat stalks, heavy with grain, would normally wave on a breeze in the late summer, the searing drought of 2012 has zapped nearly every inch of land across the Kansas plain, leaving it burnt and lifeless. There was no way to hide from the drought in the Grain Belt. Just one year after the worst dry spell in a century devastated farmers in Texas, it spread like a virulent disease into the Midwest—the breadbasket for much of the world’s corn, soybeans and of course, wheat. Sept. 10, 2012… St. Louis, Mo… As Congress returns from recess this week, the American Soybean Association (ASA) announces the launch of the Soy Action Center, a grassroots communications portal through which ASA’s 21,000 farmer members can connect with their members of Congress, administration and federal agency officials, and state and local offices. “The Soy Action Center will be a very valuable tool for our members moving forward,” said ASA President Steve Wellman, a soybean farmer from Syracuse, Neb.